Please share about your journey to become a fashion designer? Looking back, can you remember any moments growing up that hinted you'd embrace this career. I did not always know that I would end up in the fashion industry but looking back; it makes total sense. From a very young age, I started to put a lot of thoughts into the outfits I would wear. I understood that the clothes I put on my body were a reflection of my personality. When I applied to fashion school, it was to end up in a public relations or advertising position eventually. But during my fashion studies, I discovered the ugly truth about the industry: the poor conditions in which the sewers work in and the devastating environmental footprint it is leaving on our planet. I could not see myself contribute to an industry that brought so much harm to our world, so I entirely moved on from this initial career choice. It’s only a couple years later, after finding myself unhappy in my new career, that I reconciled my relationship with fashion. I discovered a community of conscious consumers and slowly built my ethical closet. It’s during that process that I noticed a gap in the market: there was not a lot of Canadian options of what I look for when I invest in slow fashion. The idea of being a designer had crossed my mind a couple of times before. But I always thought there was already so many cute clothes out there; I did not see the point in creating more of them. With the whole slow fashion ethos, there was all of the sudden a good reason for me to create my brand. My line would differentiate itself from others by being ethically manufactured, timeless, made with Eco-friendly fabrics and versatile. It now made sense. I could never work for or build a brand that would not align with my values. It’s as simple as that for me. The whole reason I created Harly Jae was to bring an ethical option to fashion lovers like me who also care about the footprint their buying habits leave on our planet. I always strive to be as Eco-friendly as possible. The more I learn about the industry, the easier it is getting. For me, it all depends on the piece I am designing. For example, if I am making a linen tank top, I will first try to source organic linen rather than regular linen. I will make sure to use cotton thread rather than polyester thread, so the garment is biodegradable at the end of its lifecycle. 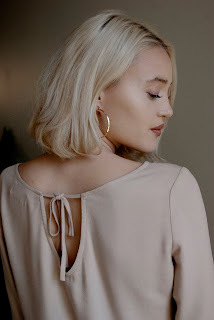 If I am designing a form-fitting piece like my Bardot jumpsuit, for which some polyester and elastane were required to make the fit happen, I spend more time on product development. In other words, I make sure that if I bring polyester to this world, it will be loved by my customers A LOT and worn until it is unwearable. For this particular piece, I also made sure to reuse my leftover fabric from production. I created some 70s inspired shorts for the Summer! Vintage fashion is my biggest inspiration. If you love thrifting, you know the feeling of pulling up a piece from the racks and thinking “wow, they don’t make clothes like this anymore.” That’s the biggest compliment you can give me when looking at Harly Jae pieces. Being inspired by past trends also helps me design pieces that won’t go out of style next season. Although I consider my aesthetic to be very current, it is not reflective of fad trends that will be out of style a couple of weeks after they made their entrance. I describe my designs as feminine and vintage-inspired. I created Harly Jae because I saw an opportunity to build a brand that would not only reflect my aesthetic but also emulate what I look for when I invest in slow fashion: clothing that is inspired by the past, made to last, and with planet earth in mind. My clothing transitions from work to happy hour, and transcends trends and seasons. I am incredibly focused on the “wearability” of my garments: I make sure that my pieces are not see-through and not too revealing. I try to eliminate any excuse someone would have to not wear the clothing. I use Eco-friendly fabrics as much as I can (organic cotton, linen, and hemp) and recycled paper for my branding material. I am moving towards releasing new pieces piece by piece rather than creating whole collections. You can shop Harly Jae online and in a few select boutiques in Vancouver. Designing with purpose requires more efforts and planning than merely designing what you think people will like. As I mentioned above, I want my pieces to make sense, to be versatile, and to be cherished for many years. This requires more thinking and time and also letting go of a lot of ideas. I am also limited in terms of fabric I use, which can be frustrating sometimes! I obviously recycle and compost. I carry a water bottle and reusable bags everywhere I go. I use stainless steel straws. With some exceptions, I follow a vegetarian diet while always aspiring to be vegan. I shop second hand before buying new and am intentional about the purchases I make. If I’m not wearing Harly Jae, I am wearing vintage or other ethically produced garments. 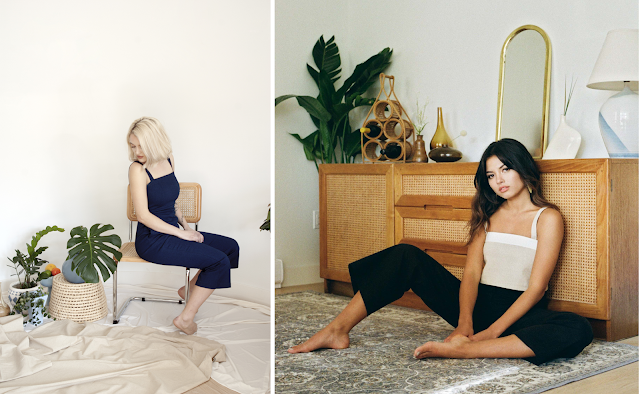 How did you connect with Vancouver Sustainable Designers, and what are the benefits of being a member? A fellow designer introduced me to the group. Concretely, I found my new production partner and a facility that handles the pre-washing of my fabrics thanks to this fantastic group. Being a member allows you to have access to the more resourceful people around – people who do the same work as you do – and endless support. This is something I am still struggling with, but I am about to put in place more tactics to overcome this challenge. The key is sharing information. Sharing about the impact of fast-fashion on people and the planet, explaining why your product is worth more, being honest about your pricing, and not being afraid to talk your product up. In my case, the sewers who sew my garments are paid a fair wage and do it in the comfort of their home, some of the fabrics I use are sometimes eight times the price of unsustainable fabrics used by giant retailers. I can spend a year perfecting a piece before it is ready to my customers, etc. I recently launched new pieces that you can check out in the link below! If you are located in the Greater Vancouver area, I am always happy to meet people in person so they can try on the clothes. You can also catch me in front of Neighborhood Quality Goods on June 17th for Car-free day on Main Street.